Apple's announcement of iOS 9 at WWDC 2015 provided a few hints that the next generation mobile OS is setting the stage for an iPad Pro announcement this fall. Now, thanks to code found inside the developer beta of iOS 9, we have further evidence that a larger iPad model may be in the works. Developer Steve Troughton-Smith discovered a larger software keyboard in the iOS 9 SDK with a familiar layout that resembles a standard keyboard found on Apple's MacBook notebooks. The keyboard also comes with an additional row of smaller keys for symbols in the main view and numbers in a secondary view. Apple may be eliminating a third screen for the keyboard, consolidating to two different screen views. Currently, users can switch between an alphabet view, a numbers view and a third screen with additional symbols. 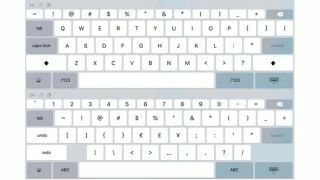 On the screenshots of the new iOS 9 keyboard posted by Troughton-Smith, there are two screens, meaning that there is enough room on the keyboard to eliminate the third screen containing additional symbols. The primary keyboard screen shows five rows of keys – a dedicated row for the space bar, three full rows of alphabet keys, and a smaller fourth row of keys for symbols. The symbol keys are what are found on the number keys on Apple's hardware keyboards today. On the second screen, Apple displays a fourth row for numbers as well as three rows for additional symbol keys. There are also quick keys to undo and redo typing in this secondary view. A number of new features introduced with iOS 9 would make sense on a larger screen. Apple showed off a split-screen multitasking view, which users can resize, along with an improved QuickType keyboard. Users can tap on the software keyboard with two fingers to gain cursor control, making text selection easier. Apple also announced that better hardware keyboard support will be coming to iOS 9, which could mean improved keyboard folios and docks could arrive alongside the larger iPad Pro tablet. Currently, third-party manufacturers like Belkin, Logitech and Zagg create keyboards for the iPad Air and iPad mini series. iOS 9 is slated to arrive this fall, and Apple is also expected to refresh its mobile hardware, which includes iPhone and iPad during that time frame. The iPad Pro is rumoured to deviate away from the 9.7-inch display on the iPad Air 2, a screen size that Apple has kept consistent since iPad's debut, and the 7.9-inch screen on the iPad mini 3. The Pro model is believed to arrive with a 12.9-inch display, placing it in the same category as the Windows-powered Microsoft Surface Pro 3 and the Android-powered Samsung Galaxy Note Pro 12.2. Other hardware features rumoured for the Pro tablet include multiple input ports, potentially with USB-C on board, stereo speakers and digitizer support. The iPad Pro may also feature Apple's Force Touch technology for the display, which can provide haptic feedback and enable new gesture controls. The iPad Pro may also come with NFC technology, allowing owners of the tablet to use it as a cash register for Apple Pay.